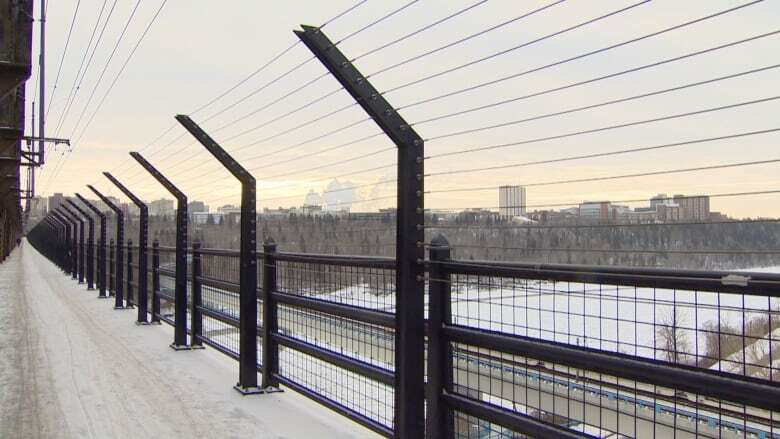 Edmonton police are still dealing with a high number of crisis calls to the High Level Bridge despite barriers aimed at preventing suicide attempts. Edmonton police are still dealing with dozens of crisis calls to the High Level Bridge despite barriers aimed at preventing suicide attempts. The horizontal mesh barriers were completed in July 2016. A year later, the city said the barriers helped cut the number of attempted suicides by almost 50 per cent. 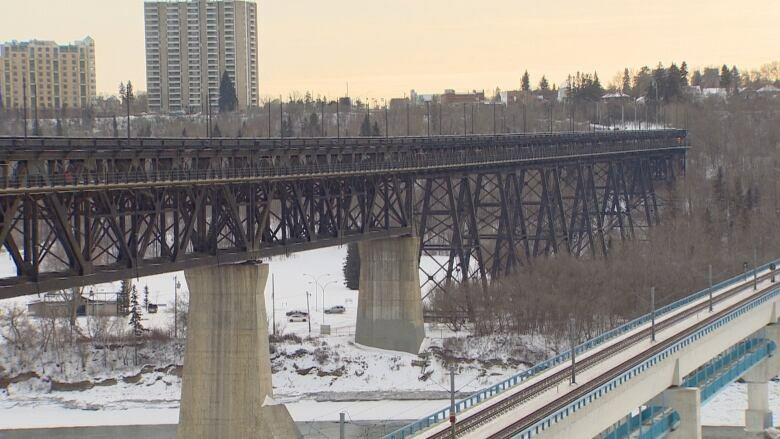 Thursday, the Edmonton Police Commission reported there were 96 crisis calls originating from the High Level Bridge in 2018, down slightly from 114 in 2017. In 2016 — the year the barriers went up — police dealt with a similar number, 104 crisis calls, according to the report. City Coun. Scott McKeen, who sits on the police commission as a council representative, expressed dismay. "I had hoped for better," he said. "I really hoped that we had solved the majority of the problem there by putting up the barrier to prevent suicide attempts." McKeen said he's confident lives have been saved with the barriers, but said that "we maybe didn't solve our problem, or solve it enough." McKeen expressed regret for voting for the less expensive barrier option in 2014, when council approved the $3 million design. "We took advice, we heard from citizens and we made a decision," he said. "I would like that vote back personally, to send it back one more time to get a little more information on the more expensive option. But it is, I guess, part of this role that no decision you make will be perfect." The more expensive option, costing nearly $7.5 million, was described as a "state of the art" design with a vertical stainless steel tension cable barrier. McKeen described the barrier as angled and being a kind of net, used on bridges around the world. 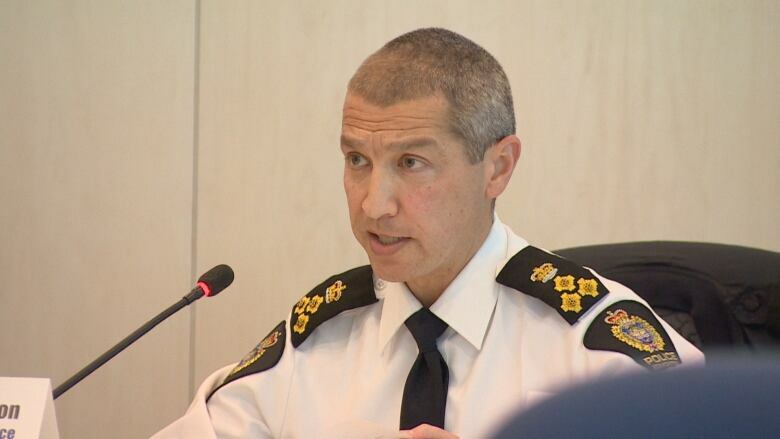 Greg Preston, acting police chief, said he believes the barriers deter some from jumping but it's difficult to prove to what degree they prevent suicides. He said the number of calls to the High Level Bridge puts a considerable strain on police members attending to the situation. Often, police will apprehend someone under the Mental Health Act, during which police must stay with the person until they've been admitted to hospital. "As a result there's a significant cost associated with that," Preston said. The current barrier also poses a challenge for members to access those on the edge, as they have to harness themselves in. While police responded to nearly 104 crisis calls in 2016, they attended about 970 total calls, including things like vandalism, mischief and motor vehicle collisions. Attending to that number of calls is estimated to have cost $4 million, the report says. The report also describes the bridge as an iconic landmark with easy public access. "This makes it alluring for those in crisis but does not allow for easy rescue access for emergency responders." Preston noted that structures considered iconic in any city tend to get attention. "I do believe there are people drawn to the bridge because it is an iconic figure for the city and as a result, if they can tag it or do something, maybe they'll get the attention they desire." The police commission passed a motion for police and city administration to explore further options to preventing suicide on the High Level Bridge. The city and police collaboration is expected to report back to council's community and public services committee in June.